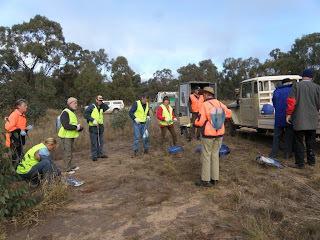 Even a very bad weather forecast did not deter a hardy band of 8 volunteers from Wedderburn Conservation Management Network and Wychitella Landcare group joining 6 Parks Victoria Staff at “The Granites” (Mt Eggbert). 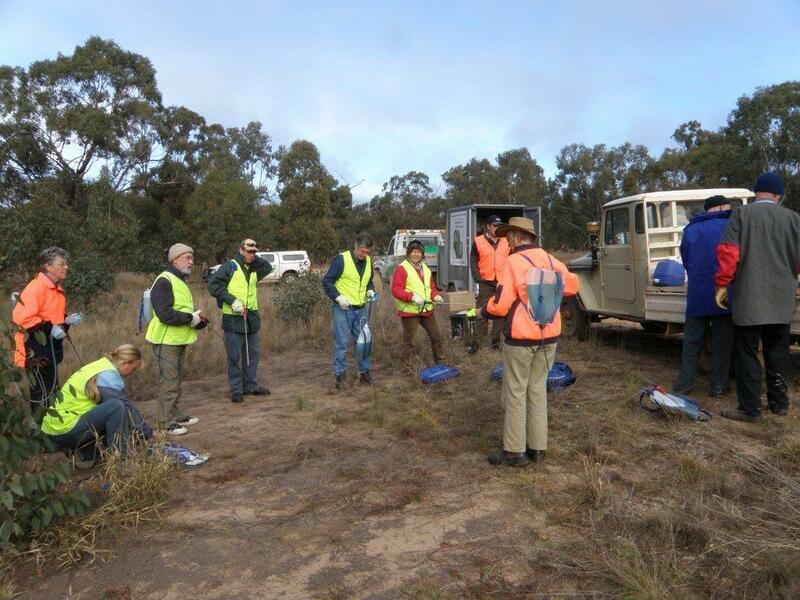 The task was – to perform some concerted work on injecting wheel cactus in the adjacent public land managed by Parks Victoria. We were fortunate to have the use of the relatively new Mt Tarrengower trailer, complete with many injecting guns, backpacks and chemical, plus as we later discovered the all important barbeque.The team had an “induction” by Janet Richardson, the most experienced wheel cactus injector in the district, then set off to work across the flat area on the Eastern side of the road. With so many people working, it didn’t take too long to cover that area. We then tackled the area on the main reserve. Although in recent months work has been done on reducing the considerable population of cactus, they still seem to keep reappearing. As an illustration of the challenges faced with controlling wheel cactus – It was discouraging to come across a school group walking through the area, and then later discover that a number of cactus wheels had been chopped off or chopped up and left on the ground – thus allowing more plants to grow. A hearty barbeque lunch was had amidst a few light rain showers. The weather was now looking more threatening, so we decided to call it a day. There is still plenty of work to be done in the area for another time.